When it comes to changing your wardrobe seasonally, the only real rule that counts is preparation, preparation, preparation. So with February nearly finished, it’s probably time that you begin thinking about what’s going to be making an appearance on your feet this time around. I should point out that this article will presume that you already have a few standards in your wardrobe. By this I mean a pair of grown up trainers, some black and brown lace-ups (either Oxfords or brogues) and probably a boot (or two) should have already been invested in. I’m also going ahead on the basis that you already understand how to take care of your shoes once you have bought them. This is often one of the key things that guys forget and is the reason their shoes never last more than a year. If you’re not familiar with the art of keeping your shoes in a decent state, then I recommend you check out our very own Will Colman’s articles on the subject [How to Polish Shoes | How To Care For Suede] – they will give you all the tools and guidance you need. Oh man, I can already feel the amount of stick I’m going to get for this one. But before you jump to any conclusions and start banging on about how ‘TOWIE’ they are, hear me out. They’re a classic shoe that has been in fashion for over 100 years. If they were good enough for JFK, Paul Newman and Steve McQueen, surely they’re good enough for you as well? You also have a lot of options available for you too; a canvas pair are definitely summer appropriate but an all white leather pair will also prove to be more versatile and easier to dress up. Don’t be afraid to let them get a bit scuffed up too. Remember that just because an item gets worn – and therefore stereotyped – by a particular group of people, it doesn’t mean you should just give up it, especially if you were wearing them before! You just have to re-establish the way you wear them and keep going. 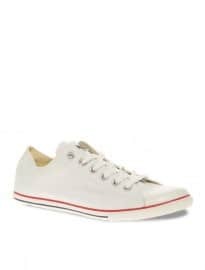 I often find that guys tend to ruin a classic look such as white Oxford cloth shirt, navy cardigan and slim blue jeans by wearing a ridiculous pair of hi-tops, when all they needed were a suitably classic shoe like a Chuck Taylor or Jack Purcell. Now if last summer taught us anything, it was that suede was back in a big way. Spring/summer 2012 will see the industry build further on this influx of premium material footwear, with an even larger variety of colours and styles coming to the market. This year, why not get a bit more adventurous than the pair of desert boots or brogues you eased yourself into last time. 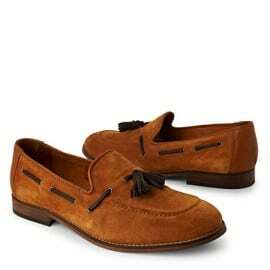 Pick a loafer; my personal favourite will be a tassel loafer (another key style to watch for the coming season) in a rich chocolate brown that will go perfectly with a pair of dark jeans or white chinos. Often made from soft brushed suede – or if you search hard enough, buckskin – this shoe really is the perfect spring addition. 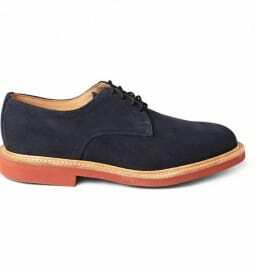 They come in a standard Derby lace up style but due to their material can be dressed down with chinos and are the perfect partner for those of you who like to go for the preppy shorts and blazers look. I have a pair in an off white from Reiss that I’ve already started wearing but a tan or light blue version will work just as well. 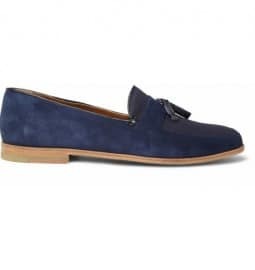 The brilliant thing about this style of shoe is that they will look better and better the more worn in and beat up they get (much like your desert boots). For whatever reason suede currently has a reputation as a precious fabric that must never get dirty, when in fact it really is quite a durable material. Let yourself go and let your suede live a little! They officially blew up across the pond last year and are now making their way over to the UK. This is great news because they are my favourite style of shoes at the moment. The two buckle straps add a great piece of detail to an otherwise standard Derby silhouette, and they really allow you a chance to express yourself. 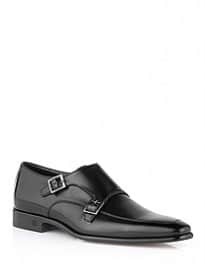 Go patent black leather for a classy option on a night out/spring wedding, or keep things simple with brown in either leather or suede (if you’re not bored of it already) and wear them with absolutely everything. Sometimes with all the options out there, we neglect the basics. Every guy needs a pair of sandals at the ready for that last minute weekend getaway to the coast. Keep them simple, with only one (or a cross) strap going over the ridge of your foot. Keep them all black to maintain subtlety and versatility. And only ever wear them from your car to the beach, beach house to the beach or the sea to your car. Anywhere else and I’ll find you… and I will slap you. So there you have it guys. 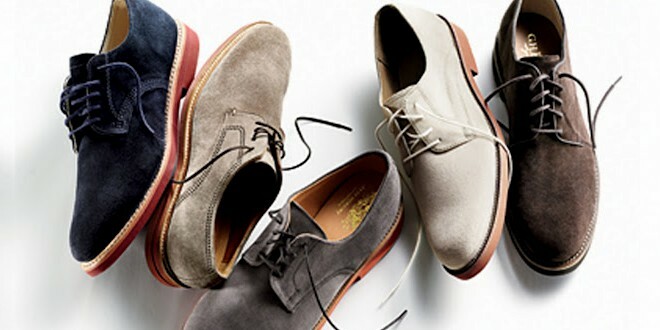 My pick for the top five shoes you should consider getting for this coming spring/summer. But what do you guys think? Do you agree with the list? Do you feel I’ve left a key shoe off? Do you doubt the power of my slap?